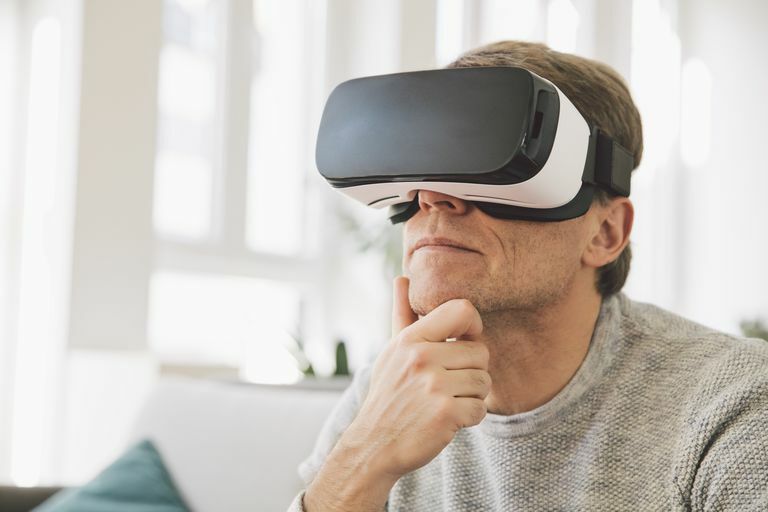 You may have heard about the virtual-reality headset Oculus Rift, owned by Facebook, or the Microsoft HoloLens, an augmented-reality headset making tech headlines as of late. These devices are just two examples of a burgeoning category of wearable tech. Let’s take a more in-depth look at these two gadgets, as well as some competitors from other big-name companies. One thing to keep in mind as you read about these various devices: Augmented reality refers to overlays of information — such as weather, directions or elements in a game — that enhance your view of the real physical world (a la Google Glass), while virtual reality implies an immersive experience completely separate from what you’d see in front of you when you’re not wearing a head-mounted display. When your company gets acquired by Facebook for $400 million in cash and more than $1 billion in company stock, people take notice. That’s exactly what happened to Oculus VR, the company behind the Oculus Rift virtual-reality head-mounted display. Though a consumer-ready version of the device is still in development, previous developer editions provide clues about what we can expect from the final product. The display is visible via dual lenses, and the device is configured to offer stereoscopic 3D perspective. The consumer version features built-in audio, improved head and positional tracking, wireless operation and a higher-resolution display. As far as use cases go, the Oculus Rift has already found some adopters in the gaming space; titles such as Half-Life 2 and Hawken support the Oculus Rift dev kit. While the Oculus Rift falls under the virtual-reality category, Microsoft’s HoloLens is an augmented-reality headset. The HoloLens works with apps built on the Windows Holographic platform, which essentially lets developers convert Windows 10 applications into holograms for the head-mounted display. Microsoft has said that the HoloLens will find use cases as wide-ranging as playing Minecraft and providing virtual anatomical lessons to medical students. The device is available in about 40 countries. It may seem surprising that HTC, a company best known for its smartphones, entered the head-mounted wearable space, but it all makes sense when you consider its partner: video-game development heavyweight Valve Corporation. The HTC Vive works with SteamVR base stations to track your movements, and it's tethered to a PC, and controllers let the user interact with the virtual-reality world before his or her eyes. Unsurprisingly, the focus of the HTC Vive is gaming — recent demos include a version of Portal. Daydream is the name of Google's virtual reality (VR) platform. The actual device is the Daydream View (now in its second generation), a soft, lightweight fabric headset into which you insert your compatible Android smartphone. The Daydream View has high-performance lenses, which results in better image clarity and a wider field of view. It is also made to fit over most glasses, which significantly differs in design from other headsets in that it only has a strap that goes around the back of your head. There are also tons of awesome apps that work with Google Daydream View. Samsung's Gear VR (Innovator Edition) headset is compatible with a few of the company's smartphones. To use the Gear VR, you secure a compatible Samsung phone in front of the headset. Doing so lets you experience panoramic virtual-reality games, videos, and images. Interestingly, Oculus VR teamed up with Samsung to develop the Gear VR Innovator Edition, and this device clearly isn't meant to compete with the Oculus Rift. Think of the Gear VR as "virtual reality lite" or mobile virtual reality. Android Smartwatch Plus iPhone: Does This Pairing Equal Success?